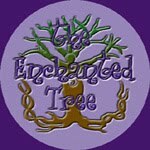 The Enchanted Tree: Raising Black Swallowtail Caterpillars. One of our favorite activities each summer is to raise monarch caterpillars into butterflies. Near the end of July we begin taking weekly walks down the road checking the milkweed plants for monarch eggs and caterpillars. This year we were surprised by the lack of monarchs. We have seen very few monarch butterflies in our flowerbeds. Walking down the road we realized there was very little milkweed this year, and no caterpillars. We checked several times and the last time we walked we found that the county mowers had come through and cut down all the milkweed. So we figured we would not be raising any caterpillars this year, the first time in probably 7 or 8 years. Then one day last week, i was delighted to find a Black swallowtail caterpillar munching on my carrots. 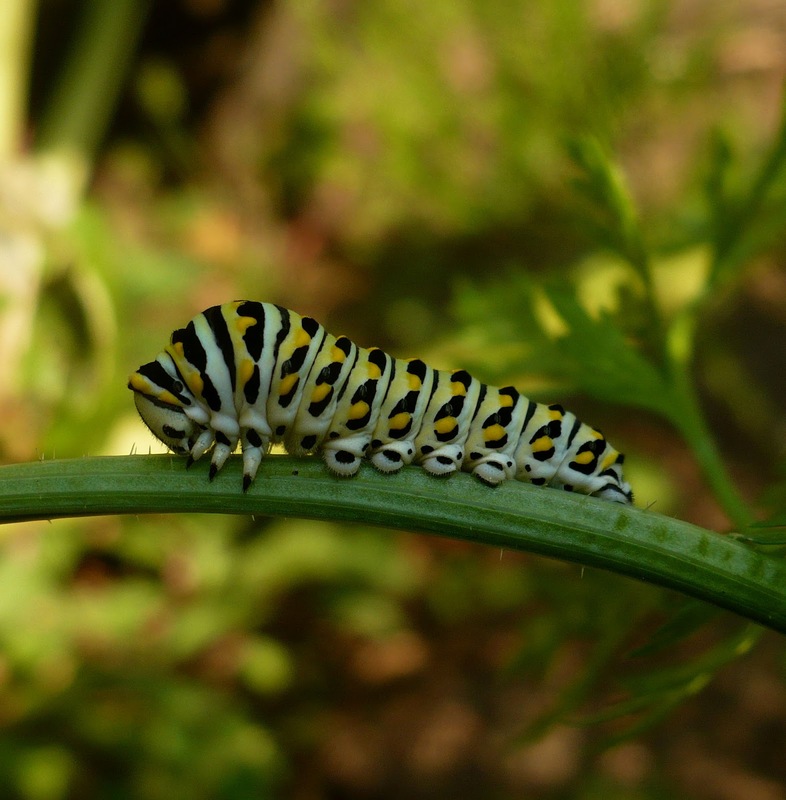 i plant dill and fennel every year because it is supposed to be a Black swallowtail favorite, but i haven't attracted any Black Swallowtails to it yet. i was not expecting to find one in my carrots, and after looking around i found 5 others. So i began to photograph them in the different stages. 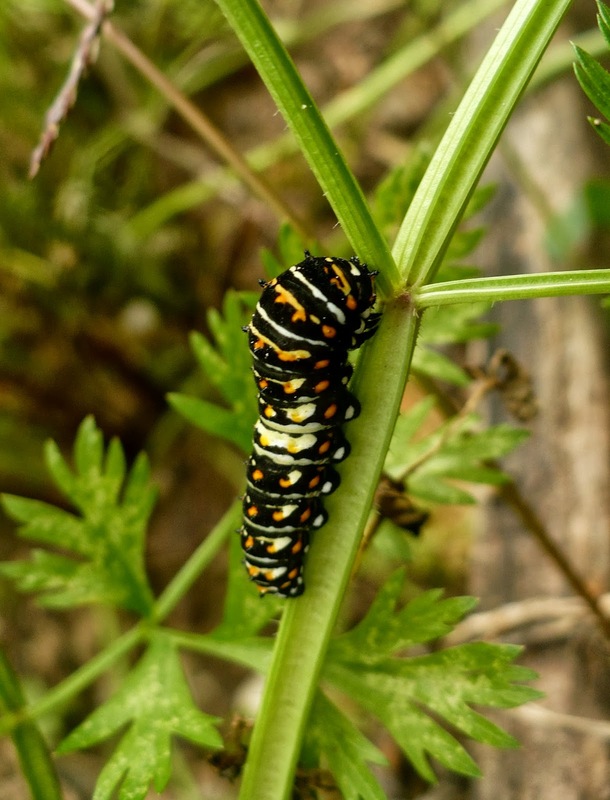 Black swallowtails go through several stages or instars, where they shed their skin and change their look a little. This first one is about 1/2 " long. 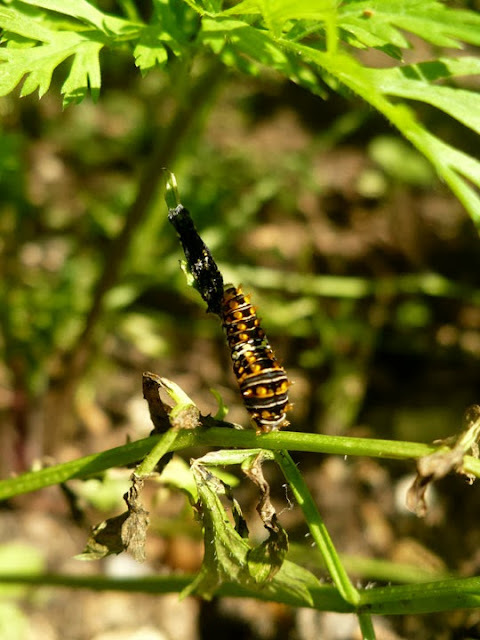 It is in the first Instar. After shedding it's skin the first time it enters the second instar. This one is about 1" long. He's a bit more colorful than the one before. During the Third Instar the caterpillarstarts getting quite a bit larger. He looks almost like a full sized BS caterpillar, except he is rather pale.The full grown caterpillars are green with the same markings. This guy is full grown. He is resting, and will soon wander off to find a suitable place to form his chrysalis. i had originally left these guys on the carrot plants and have been checking them regularly. We really don't have a good place to keep them inside. 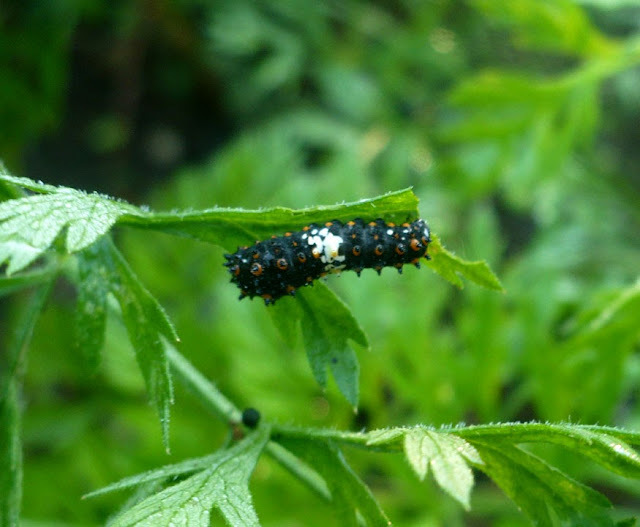 Yesterday i noticed that a mole had started to nibble some of the carrots and the plants were wilting with the caterpillars still on them. So i knew i needed to move them. i used to raise the monarchs in a 10 gallon aquarium. 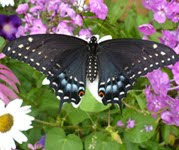 i also had a butterfly garden from Insect lore that i used for the emerging butterflies. Since i nolonger have any of those items, i had to find something i had on hand. This is a $1 popup clothing hamper that i picked up at the dollar tree a while ago. i have my washer set up in the shed, and i found that these cheap hampers work well for sorting clothing in there. 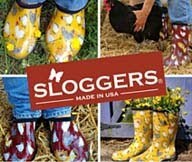 They also work perfect for raising caterpillars! In the bottom, i placed a pot with soil and i have a glass jar with water that has fresh carrot, dill and queen anne's lace leaves/stalks in it. 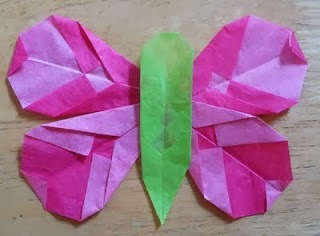 Once the caterpillars get large enough to start wandering, i'll add some sticks and leaves and things so it can find a good place to create a chrysalis. 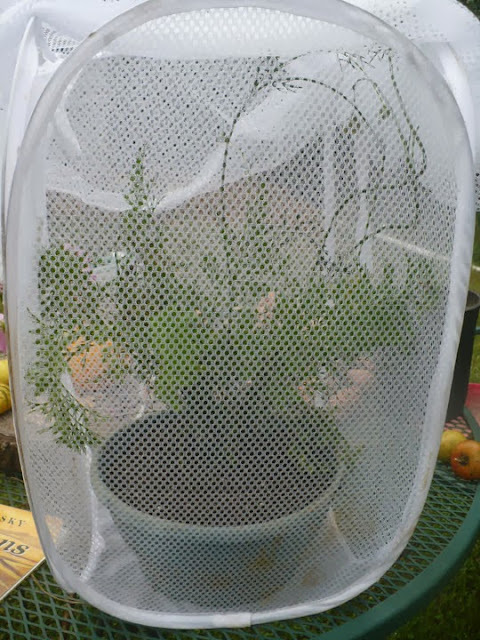 i also used a mesh laundry bag (also from dollar tree) to go over the top to keep predators out, and caterpillars in. So far they seem quite happy, and are munching away on the fresh green plants. 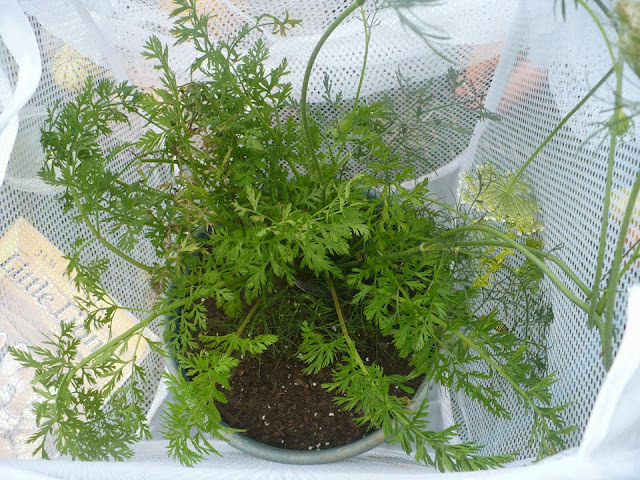 i may try to transplant some smaller carrots into the pot, but i'm not sure how well they' do. Next year, i'll be planting carrots, dill, parsley and fennel in this pot specifically for raising BS caterpillars. :) These are some of their favorite food sources, and they don't eat enough to hurt the plants. 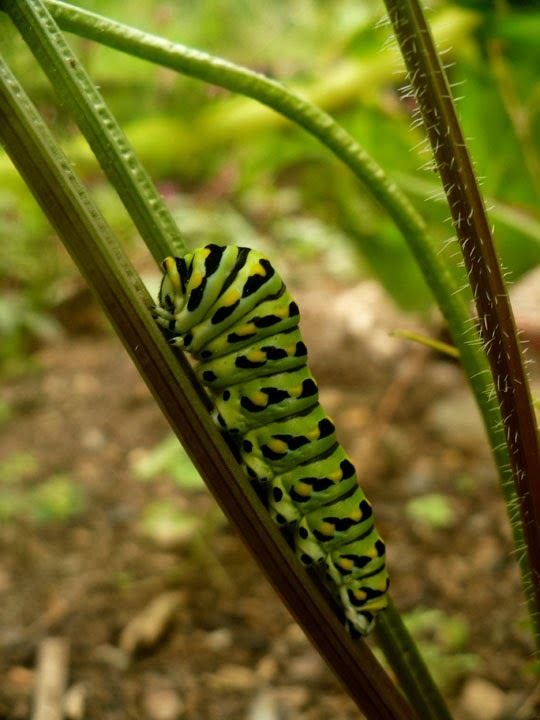 Although i'm really bummed that we are not raising monarch this year, i'm excited that we get to raise the black swallowtail. Monarch populations have been declining the last few years due to the lack of milkweed which is their only food source. Many people think of milkweed as an invasive weed, so they spray it or cut it down. If you want to help the monarchs you can plant milkweed in your yard and other flowers that attract butterflies such as tall phlox, gaillardia, butterfly weed, purple cone flower, tickseed etc. Native wildflowers are always best. You can also request free milkweed seeds from Livemonarch.com . i'll post updates on our caterpillars until they form they're chrysalis. Because the temperatures are getting cooler, there is a good chance they will stay in their chrysalis all winter and will emerge in the spring. i'll be keeping them outside in the shed, so they experience the change in temperatures and do not get confused. We raised a swallowtail a few years back that stayed in his chrysalis all winter, and then emerged too early because of the warmth of the house. 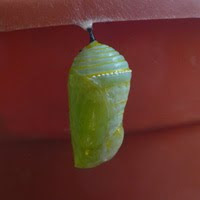 I have a swallow tail chrysalis that I wintered. Are there any that take that long? Yes, if they form their chrysalis in the fall they will often wait until spring to emerge. It's best to keep it in a cool place, so that the heat of your home doesn't cause it to emerge early.